Last night I picked up my new bike. It's a 2009 Specialized Allez Triple. 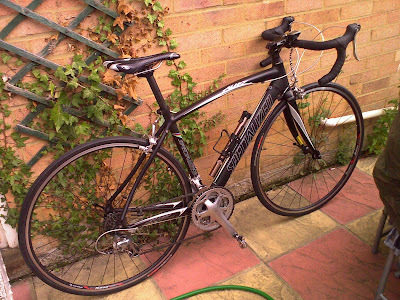 It's pretty standard apart from the brakes which have been upgraded to Shimano Ultegra. I didn't get much of a chance to ride it last night as it was getting dark by the time I got home with it. I managed only 3 miles but in that first ride I noticed a couple of things. Firstly, it's surprising how narrow the handlebars feel compared to riding my mountain bike. It's not a problem for normal riding but I reckon it will take a little getting used to when riding standing up. Secondly, braking. This is completely different to my disc brakes on my mountain bike. The stopping power of the road bike doesn't seem as good and getting a good grip on the levers seems like it will take a while as I get used to the riding position and grip on the drop handlebars. Any tips or suggestions you wish to throw my way would be much appreciated. Overall though I'm impressed. The bike weighs 9.7kg (21lb 6oz) compared to the 14kg (30lb 14oz) of my mountain bike so it is noticeable lighter. An interesting fact for you, I have lost the combined weight of both my bikes. Try lifting a mountain bike and a road bike and carry that around with you 24 hours a day! That's what I was doing back in March. Toby you really are doing well. The new bike looks well smart, I'm more of a roadie than an MTBer although I do love getting dirty on my mtb. Road bike tips. 1. Always inflate tyres to max pressure or a few psi under save pinch puncture. 2. Fizik Gel pads are a nice upgrade if you start spending alot of time on it. 3.I find riding on the hoods the most comfortable. Unfitguy - I've been advised the same by the guy I got it from so that's good. Gel pads; I'll keep that in mind. The hoods? I'm guessing that's just behind the brake levers? Les - Cheers mate. I'm not sure what I'll be riding now. You'll just have to wait and see! JB - Stopping in the rain? I'm guessing that's not good? im pleased for you mate.